Sometimes you just never see what's coming. A neighbor of ours took in a small mare for training, and about a month after she arrived she started getting a rather large barrel on her. After a vet check, it was discovered that she was in foal so the training came to a halt. The owner wasn't sure of the sire, but we were all expecting another horse. Then one morning a small fuzzy black foal was lying on it's side near it's mother. Suddenly, it raised it's head and looked at everyone, along with ears that seemed as though they were a foot long. 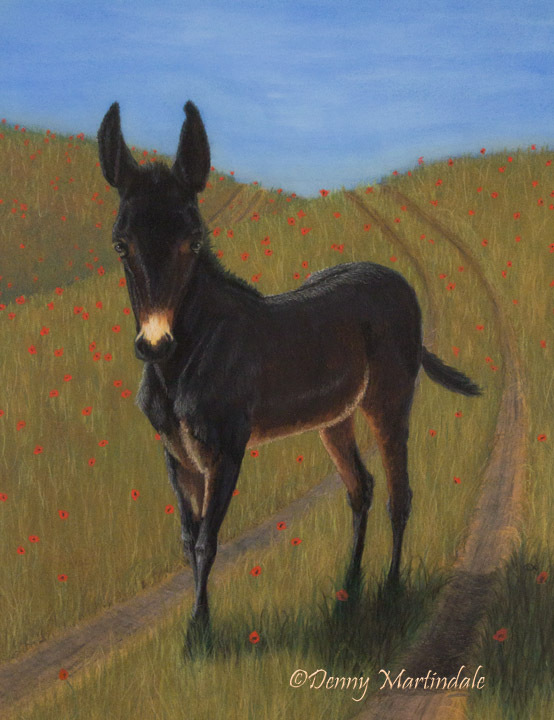 She was quite the site at first, and so, Jewel the mule was born. She was on the small side but extremely energetic and quite the ham. After a couple of years she was sold to a man that had another black mule the same size. He wanted a matched pair to pull his wagon for the ﻿Columbia Mule Days﻿ parade held every year the first week in April in Columbia, TN. I painted this pastel of her when she was a few months old. For a fine art greeting card of Jewel by clicking here.